This year you’re invited to join the Parish of Calvary-St. George’s, one of New York’s longest continuously operating episcopal parishes, for its annual Candlelight Lessons and Carols service on Sunday, December 9, 2018, at 4:00 p.m., with a prelude at 3:40 p.m. The historic St. George’s Church on Stuyvesant Square will once again be the magnificent setting for this service and a gift to our city. St. George’s is a New York City landmark and is also on the U.S. National Register of Historic Places and has, for years, stood as a witness to both mission and service in our city. The parish’s tradition of congregational carol singing began in the 19th century when The Reverend Dr. William S. Rainsford established a Christmas festival for the neighborhood. 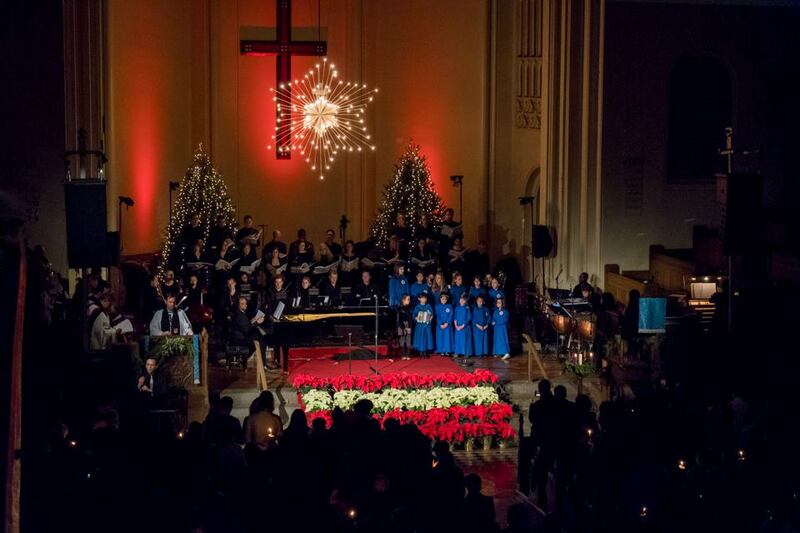 Though the Candlelight service has taken different forms in the many decades since, it remains a special offering to the community, convening thousands of people to joyfully sing a celebration of Christmas! Many linguists believe the word “carol” derives from the Greek “Kyrie Eleison” (Lord have mercy upon us). Candlelight through lessons & carols gives us a chance to recall the merciful acts of God and reorient our lives to that mercy working through us, loving others as he has loved all of us. Under the direction of Kamel Boutros, the parish choirs and orchestras will perform musical settings by Antonín Dvořák, John Rutter, Benjamin Britten, and others, with plenty of congregational caroling binding the service together. And the exceptional young musicians of the Calvary-St. George Music Academy will also perform. Don’t miss the opportunity to make the tradition that thousands of New Yorkers have embraced your own this Christmas. This service will begin at 4:00 p.m., with a prelude at 3:40 p.m.
St. George's Episcopal Church is located at 7 Rutherford Place between 16th and 17th Street in Manhattan, just east of Union Square.